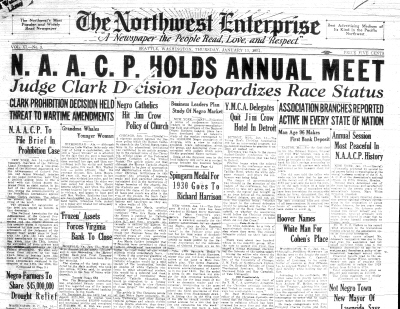 Founded in 1920, The Northwest Enterprise served an important role in supporting and maintaining an emerging African American community in Seattle, Washington and throughout the Northwest. The newspaper served its community in five specific ways: visibility, success, support of black institutions, community leadership, and resistance. The Northwest Enterprise quite literally made African Americans visible, running stories and photographs of famous blacks (e.g. Joe Louis) as well as everyday people, such as a local barber or druggist. The paper presented a stark contrast to the Seattle daily newspapers, which either ignored or stereotyped African Americans. The Northwest Enterprise also emphasized African American successes. The paper featured not only the achievements of the famous (e.g. black athletes in the 1936 Olympics such as Jesse Owens or Ralph Metcalfe) but also “ordinary” people who graduated from high school or college or worked in their churches. The newspaper also publicized local institutions, such as churches, lodges, and civil rights groups, signaling their importance. In turn, such organizations used The Northwest Enterprise as a vehicle for relaying their plans and soliciting new members. Gerald J. Baldasty and Mark E. LaPointe, “The Press and the African-American Community: The Role of the Northwest Enterprise in the 1930s.” Pacific Northwest Quarterly, 94:1 (Winter 2002/3), 14-26.